Highest quality marine grade stainless steel cable from 2mm diameter to 16mm diameter. 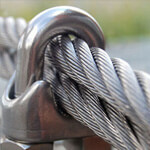 The 7x19 construction stainless steel wire rope is highly flexible. This also means it is not as strong as either 1x19 or 7x7. 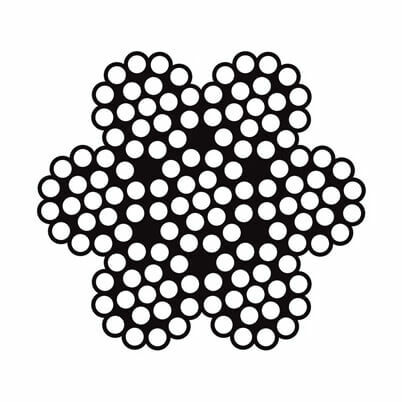 7x19 wire rope is suitable for most running load applications & numerous applications such as security cables & winch cables. All provided in 316 (Marine) grade stainless steel. 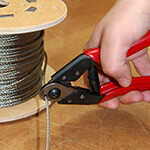 7x19 Stainless Steel Wire Rope - Demonstration of the characteristics of 7x19 stainless steel wire rope. Low strength and high flexibilty. As required for trellis work. Just the job. This product was so generously measured we had some left over. It is now being used to suspend the bore hole pump. Excellent quality and value. Speedy delivery, everything you want! Marine quality just what we needed for our decking. cuts easily with the right cutters. The item was delivered without delay, top quality product. The wire rope feels nice in your hands. I perhap wish I'd also purchased the cutter as mine is maybe a bit blunt. Great quality wire rope but remember to wear gloves as there can be stray broken strands. Not the easiest to cut - fortunately I have some really good Felco cutters which gave a nice clean cut but itâ€™s the hardest thing Iâ€™ve used them on. 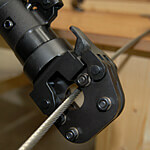 I used the 3mm version...very strong and sufficiently pliable to create loops for attaching to vine eyes, etc. Excellent product, flexible yet strong and good looking too. A rope is a rope, it did what it said on the tin. Using this on a small boat winch seems good at present. Suitable for use in a garden as tensioned wire for fan-training fruit trees. Easy to order in small amounts with quick delivery. The rope seems to be good quality and as described. Used in the building of a garden chair looks good and seems strong enough. Nice quality rope. Looks good, not industrial. Great product as specified and as required! Nice and flexible and an excellent grade of stainless steel for the price. Nice and flexible rope which is what I needed. Excellent product. Hopefully it will endure under garden conditions; only time will tell. What really can I say about a simple thing like this. It is as described/pictured, it's very flexible and it does its job. Perfect, nice strong and high quality. Lovely bright strong wire, ready to receive my espaliers. This is the cable of choice for our project.